Who needs a glowstick when you've got a Limited Edition ReMOTE SL? Novation's new Limited Edition ReMOTE SL37 is just the kind of MIDI controller keyboard we like. Blessed with the company's Automap technology, it's eminently functional, but more importantly, it looks cool. 999 of the Limited Edition SL37s have been made. The design is just the same as the standard model, so you get 37 keys, eight faders and 16 rotary controllers. Transport controls are onboard, too. 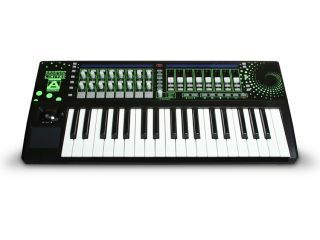 Where this keyboard differs is in its styling - its sections are demarcated with green, light-reactive lines, meaning that it'll glow in a UV club environment. If you take this bad boy on-stage, you can guarantee that you're going to stand out. And because of that Automap functionality, plug-ins are automatically mapped to the hardware as you open them, keeping setup time to a minimum. Full spec details are available on the Novation website - the Limited Edition ReMOTE SL costs around £370.